DocuSign is an electronic signature application that enables people to send, sign, and approve documents, materials, and transactions on the go. You can use any device anywhere at any time. This revolutionary platform is now the standard of electronic signature in the business world. 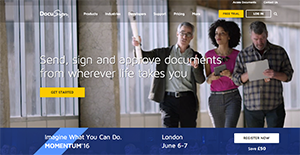 DocuSign changes the way business is being done by speeding up the workflow or approval with its fully secured digital signature technology. Businesses now enjoy faster ROI as there is no need to spend time waiting for a paper contract. Productivity is increased and targets are achieved faster as approvals of workflow and other processes are accelerated without compromising the security of data, thanks to its adherence to comprehensive policies and security certifications. There are tons of advantages DocuSign offers aside from enabling users to send, sign, and approve documents from anywhere and anytime. For one, DocuSign helps in organizing and storing documents and other materials by significantly reducing the amount of actual paperwork and clutter. The system also automates entire workflows and lets you conduct business securely from any location, which then leads to you saving time and money while enhancing the experience of your customers. DocuSign advocates paperless transactions and helps enterprises become more digital and more secure. The platform uses high level security and adheres to tight data protection protocols, ensuring that all information processed within the system are safe while delivering positive experiences for your clients. With DocuSign, users can also prepare documents, gather signatures, and have customers sign in person using a smartphone or tablet. It also comes with a robust set of features that help users assemble their documents, secure their data, and validate their signers. Companies have diverse needs and requirements and no software platform can be ideal in such a condition. It is futile to try to find a perfect out-of-the-box software product that fulfills all your business requirements. The intelligent thing to do would be to modify the application for your unique needs, worker skill levels, finances, and other aspects. For these reasons, do not rush and pay for well-publicized trendy solutions. Though these may be widely used, they may not be the perfect fit for your unique needs. Do your research, investigate each short-listed platform in detail, read a few DocuSign reviews, speak to the vendor for clarifications, and finally choose the application that provides what you require. We realize that when you make a decision to buy E-Signature Software it’s important not only to see how experts evaluate it in their reviews, but also to find out if the real people and companies that buy it are actually satisfied with the product. That’s why we’ve created our behavior-based Customer Satisfaction Algorithm™ that gathers customer reviews, comments and DocuSign reviews across a wide range of social media sites. The data is then presented in an easy to digest form showing how many people had positive and negative experience with DocuSign. With that information at hand you should be equipped to make an informed buying decision that you won’t regret. What are DocuSign pricing details? What integrations are available for DocuSign? Pros: As a salesperson I use DocuSign on a daily basis. My clients can sign the contract from everywhere as long as they can access their email or smartphone. They are able to sign with their finger on the screen and if this is the case I get email notification immediately. I often use this tool to get notification when files are viewed and completed. Cons: I don’t like that I’m not allowed to change the tool bar on the left side of the program. I don’t use all of its features and options and I would like to turn off those that I’m not using. Also, it would be great if they could work more on the customization. Pros: Nothing. The software didn't work. It kept losing my work. I called customer support and they were very nice and tried to help but all the could offer was workarounds to the many bugs and defects in this software. This might've been a good product at one point in time but it is clearly mismanaged now. Cons: Nothing. The software didn't work. It kept losing my work. I called customer support and they were very nice and tried to help but all the could offer was workarounds to the many bugs and defects in this software. This might've been a good product at one point in time but it is clearly mismanaged now.